Wouldn’t you rather own your own home? Three Shropshire housing developments have resulted in neighbourhood investment of more than £6.5 million by Redrow but opportunities to be part of those thriving communities are now few and far between. There’s limited availability at The Uplands, in Shifnal, where the final few homes are now on sale; while Redrow has already achieved sell-out success at The Coppice in Leegomery and Aston Fields, also in Shifnal. 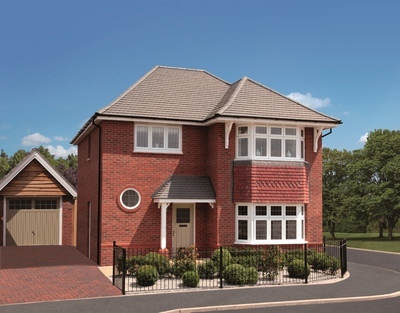 Between them, Redrow’s popular developments have provided homes for hundreds of happy homeowners. They have also benefited the wider community as Redrow has invested heavily in those areas, to help ensure that the neighbourhoods continue to thrive. For example, 76 reduced-cost homes to meet local housing needs have been built at a cost of £4.5 million, with a further £139,000 paid in off-site contributions towards affordable housing. Local authorities have received community infrastructure levy payments of almost £750,000; while schools and highways have also benefited from Redrow investment. Pauline Turnbull, sales director for Redrow Homes (Midlands), said: “Being part of a community is an important factor when choosing where to live. By investing in the neighbourhoods where we build we help to ensure that those areas continue to thrive for the benefit of existing and new residents. The final Redrow homes available at The Uplands are all three-bedroom detached Leamington styles, priced from £359,995. The kitchen is very much the hub of the Leamington with a combined kitchen, dining and family room at the heart of the home, overlooking the garden. There’s also a separate lounge, utility and convenient cloakroom. Upstairs, all three bedrooms are doubles, with the master benefitting from a wet room and walk-in wardrobe, leaving the main bathroom to serve the remaining two bedrooms. To be in with a chance of owning one of the final homes at The Uplands, visit the development, on Wolverhampton Road, open daily from 10am to 5.30pm. For the latest availability and pricing, see redrow.co.uk/theuplands.